If you’re wondering why mean old mom wouldn’t let him play the piano, it’s a reference to Ethan’s always contentious piano practice sessions. I have to sit with him while he practices. If I don’t, he plays only the pieces he knows best, not the ones he’s stuggling with, and he plays the easy bits only, eliding over the hard parts. If he plays the hard parts at all, he will play them too fast and butcher them, missing every other note, without stopping to correct the problems. In short, if he practices alone for a day or two, his piano playing doesn’t get better; it gets worse. So I sit with him. I make sure he plays every piece, that he plays them at an appropriate tempo, and that he stops to correct mistakes. I also watch his wrist position, which otherwise deteriorates over time. Ethan hates this. He wants to practice alone so he can be sloppy and not get called on it. So he fights me during practice. I’ll ask him to do the F major scale, and he’ll play the D major. I’ll put the music of one piece up on the piano, and he’ll play another. I’ll remind him that a certain measure should be forte, and he will play it piano. If he becomes so defiant that we can’t get anything done, I terminate the practice session and send him to his room. You might think he would be relieved at this–I mean, clearly he hates the practice sessions–but being sent away from the piano infuriates him. This is my best tool at managing his defiance. But when I use it, he gets really mad, and that note he wrote me is the consequence. When I saw it, I had to restrain myself to keep from laughing. 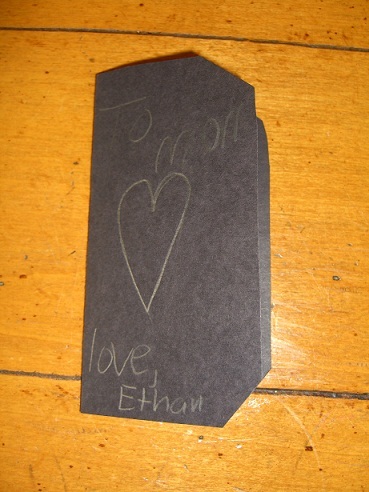 I’m not offended by a note like that from Ethan for three reasons. Reason #1: I know that, in truth, Ethan loves and respects me. He demands endless hugs and kisses and back rubs, says he loves me, picks flowers for me, and out of the blue says things like, “Mom, you’re beautiful.” The fact that he can’t dominate me seems to actually drive him closer, except for these occasional outbursts of rage. Reason #2: Even if he did hate me, it wouldn’t matter, because being loved by my kids isn’t my goal in parenting them. My goal is to help them grow into successful, productive adults who give back more to society than they take from it. My goal with piano is not to turn Ethan into a great piano player (I doubt that’s in the cards), but for him to learn the meta-lessons involved. These include learning to persevere when something is hard and how to practice (or study) effectively. I also want him to grow comfortable with interacting with powerful, intimidating people, like his piano teacher, a concert pianist who teaches some of the most talented kids in the area. The irony is that by fighting with Ethan, who clearly has a strong desire to be dominant/alpha, I’m actually serving his interests. You don’t get to be an “alpha” in this world by force of personality–you need to be good at something. Sloppy, lazy work won’t cut it. He has the raw talent. He just needs to learn to make the most of it. Reason #3: I’m not in parenting for acknowledgements or kudos. Certainly I appreciate them when I get them, but I view parenting as a “pay it forward” undertaking. I’m raising my kids as well as I can not because I expect them to reward me for it later, but because my parents did it for me and now it’s my turn. My kids can “thank” me later by raising their own kids as well as they are able. Happy Mother’s Day to all my fellow parents in the trenches! Great post!!!! I think Ethan is lucky to have a mom like you and he sounds like a treasure. I particularly liked your reason #2. I had a mothering situation with my college-aged son this weekend that felt sort of like an Ethan-piano situation but with man-sized stakes. And I told my sister something similar at the time. I will not sacrifice acting in his longterm best interests to simply being ‘liked’. That is not being a good parent. My job, even as the parent of a young man, is not to handicap him with behaviors designed to serve my need to be loved. Rather, my job is to continue to help him become the man he was meant to be. Thanks for this post. I needed this today! I’m glad you liked the post! The teen years–yikes. I’m not there yet, but they scare the heck out of me. Good luck with your boy! Fabulous post, Amy! Your reason #2 summed up exactly my approach and reasoning as well. I even tell my kids why we do the things I do and make the rules we have. I think they actually respect me more because they know it’s really all about protecting them and doing the best job I can with them. That’s how I felt about my own parents. I didn’t always like my curfew or other restrictions, but I always understood and respected the reasoning behind them. 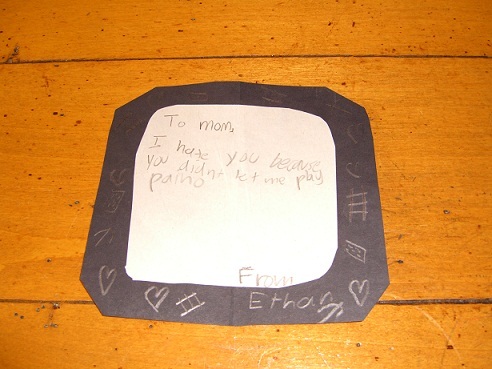 I think with the second note Ethan even learned a valuable lesson. 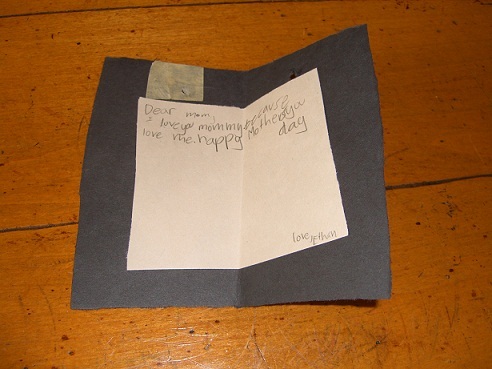 It took some empathy to realize how his first note must have made you feel. That’s a skill not everyone develops. Thanks, Gwen! I agree, I think our kids ultimately respect us more when we set limits. I think deep down they recognize that our setting limits is an act of love, however unwelcome it may seem to them at the time. An inspirational and well-crafted post, to be sure. I admire your grit in not allowing yourself an emotional reaction to something that would ruin some mom’s entire weeks, let alone their mother’s day. I loved reading your parenting philosophy. You inspired me to think about my own. How often do we ask ourselves, “Why am I raising kids? What do I hope to get out of it? What do I hope they get out of it.” Those are huge, important questions. Thanks for the nudge! Thanks, I appreciate that! I do think it’s a good idea to have a solid notion in your mind as to what your parenting goals are, since parenting is an extremely difficult job, and different people approach it so differently. Also, I find that no matter what I do, some people are going to disapprove :(. So it helps to stay centered and remember what’s important to me. I haven’t seen your little one in a while–she must be getting to the age now where she’s starting to test limits. Interesting times ahead! Thank you! The guy cracks me up.